SeaGate Terminal’s Chesapeake, VA location is a deep water terminal on the Elizabeth River. 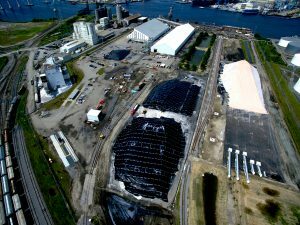 The facility has the capacity to receive barges of bulk commodities (commonly ammonium sulfate fertilizer) to a warehouse and then load panamax vessels with the warehoused materials. 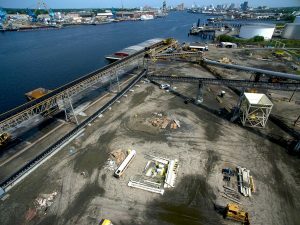 The site is located on the south branch of the Elizabeth River in Chesapeake, VA and features a 304m long deep water berth with a depth of 12.1m MLW(mean low water), 545mtph barge receiving, 545mtph ship receiving, 1,088mtph ship loader, 2 warehouses totaling 99,800 metric tons of product storage, and rail and truck access to the site. The terminal was in need of upgraded ship receiving, expanded warehousing, and load-out for ammonium sulfate and other bulk products. This was to be completed in stages and involved upgrading the existing receiving system infrastructure to feed a new 59,900 metric ton warehouse and adding new loadout systems. The project was to be completed in two phases. Phase 1 involved integrating a new conveyor, truss, and tripper conveyor system into to the existing receiving line to feed the new 59,900 metric ton building. From this storage building a new 1,088mtph load-out system was installed to feed an existing ship loader. Phase 2 included repurposing the original warehouse for new products, adding a dedicated ship receiving system, and also adding high speed rail/truck loadout system. The terminal is in an established seaport and the upgrades will allow it to operate at a higher capacity and expand the range products it can handle both now and in the future. Also included is the expanded ability to load out to rail and truck, while maintaining the high capacity ship loading. Situated on the Lower Reach of the Elizabeth river, 32km from the mouth of the Chesapeake Bay and 29km inland of the Atlantic Ocean, SeaGate Terminal offered the diverse challenges and opportunities of working in a marine environment. The first being the water itself. The river is a tidal finger of the Chesapeake Bay and has the same salinity levels as the Atlantic, making for a harsh environment that required careful attention to materials of construction. 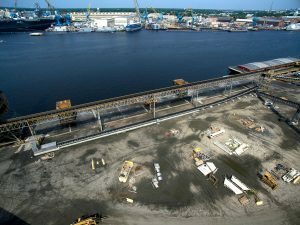 The terminal is south of Naval Station Norfolk, and directly across the river form the Norfolk Naval Ship Yard in an advantageous location that provides deep water access for both barge traffic and up to Panamax sized bulk carriers. The terminal site was originally home to an 8,360 square meter warehouse, barge receiving, ship receiving, outside flat storage, reclaimers and a 1,088mtph ship loader. While the berthing would not be upgraded, the receiving and loadout systems would. The design phase began in the sales department, gathering information and completing layouts to work out a process flow and establish general locations for the equipment. This also included several site visits and much coordination with the customer to ensure all needs were met and that the overall process flow was as efficient as possible within the constraints of the site and existing infrastructure. In order to accommodate potential future materials that could be handled at the site, research was done to ensure smooth flow of a large range of materials, including those of smaller SGNs (Size Guide Number). The research allowed confidence that the systems would be effective (proper belt sizing and loading, etc. ), efficient, and that a wide variety of materials could be handled without issue. Work on the project began with the tie in of conveyors to the original system, allowing for the construction of a new 59,900 metric ton warehouse that was placed in one of the old exterior flat storage areas. 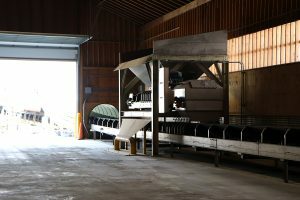 This new warehouse was designed for ammonium sulfate and features a new set of payloader fed reclaim hoppers, featuring variable speed feeder conveyors to control and even-out the material flow, and also a new transfer conveyor that would tie into the existing ship loader infrastructure. Phase 2 began with a new ship receiving system which would feed the original warehouse. This system consisted of a series of belt conveyors and truss work. Along the dock, the new receiving conveyor would be fed by stacker conveyors which, in turn, feed movable hoppers that are placed over the 545mtph belt in line with whichever hold of the vessel was being unloaded. Received bulk material is then conveyed to the existing tripper conveyor in the warehouse. Materials of construction and design parameters were specific to the corrosive environment and also took into account the dusty nature of several bulk products that could potentially be handled. The new equipment’s finishes, slopes, belt speeds, and transition designs, etc. were all custom engineered to allow for products that may bridge easily. The final step in the project was the loadout from the existing warehouse. This warehouse has a rail spur running its length that is connected to the switching yard just off the property. 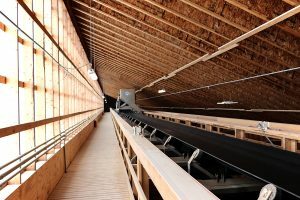 A reclaim belt conveyor with a movable hopper was installed and runs the full interior length of the warehouse. The reclaim conveyor feeds a slow speed bucket elevator which, in turn, feeds the loadout tower. Over the rail spur, a tower-based loadout system was designed for one rail loadout lane and one truck loadout lane, with provisions for an additional (future) rail lane engineered into the design. This NTEP certified wholesale loadout system is engineered for approximately 230mtph of average 961 kg/m3 material. Generally, the most bulk fertilizers handle well, but dusty products of low SGN can bridge and cliff easily and therefore require steep slopes and smooth surfaces. This preliminary engineering will ensure the terminal can handle many types of products now and into the future. The ammonium sulfate side, which directly feeds the ship loader, has the same general challenges faced by most fertilizers, being of a corrosive nature. Both systems were fully custom engineered for the environment and the challenges of a brownfield project that included multiple interfaces with existing equipment and steel structures. 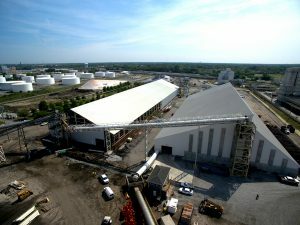 Given the environment and materials to be handled, and after discussion with SeaGate, it was decided to use a heavy marine epoxy paint system on carbon steel walk through trusses and support towers but use stainless steel where bulk materials would be in direct contact (including stainless idler frames, conveyor frames, etc.). 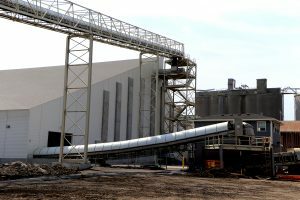 Fiberglass conveyor covers, and FRP decking was used in the towers and walkways. The SeaGate project was about finding the best way to transport materials as efficiently as possible while working with existing equipment and limiting potential failures driven by the environment. Fertilizer is corrosive enough, but in a marine terminal metal faces an old foe - the sea. Like Naval and seagoing vessels, the systems designed and built for SeaGate Terminal are tough, corrosion resistant, and as simple as possible. Using smart design to limit complexity has the benefits of limiting the amount of equipment to be installed/maintained, limiting the amount of motors used (and thereby power requirements) and streamlining material flow to its most efficient state. The use of a heavy paint scheme, stainless components, fiberglass conveyor covers and fiberglass decking limits the amount of preventative maintenance required. Lastly, building an expandable NTEP certified loadout system saves time and costs associated with scaling vehicles out of a site and also limits rework during future expansion. All of these efficiency gains can be adapted in some form to any site and used to the advantage of any business. Working closely with a customer to determine their requirements is the key to achieving a well-engineered project that features both efficiency and longevity. Sackett-Waconia’s scope included both basic and detailed engineering as well as complete supply of equipment, trusses and support structures. SeaGate Terminals has locations in Chesapeake, VA and Savannah, GA. They specialize in material handling of bulk and containerized goods. Each location has dual Class 1 rail and deep water river access. SeaGate Terminals is your preferred strategic partner, offering convenience and flexibility with added cost effectiveness.